I have been known to sing the praises of any dining establishment in Walt Disney World that steps out of the shadow of hot dogs, hamburgers, chicken nuggets, and French fries. But sometimes, you cannot help but give in to the urge to sink your teeth into a warm, juicy and delicious hot dog. My usual stop for this delicacy is the renowned joint, Casey’s Corner. 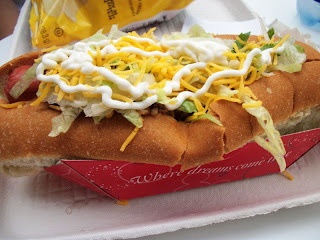 On a recent trip, however, I decided to sample to gourmet dogs from Tomorrowland’s Lunching Pad. Lunching Pad’s specialty hot dogs come in three varieties: Philly Cheese Steak Hot Dog (topped with beef slices, onion, peppers, mushrooms, and cheese sauce), Taco Hot Dog (topped with ground beef, lettuce, sour cream, and salsa), and Reuben Hot Dog (topped with corned beef, sauerkraut, Swiss cheese, and thousand island dressing). Each meal also comes with a side of either apple slices or a bag of chips. The crew I dined with selected one of each to give the dogs their due, and were presented with mountainous, mouth watering hot dogs. The hot dogs and toppings are all high quality, and negate the need for a fixin’s bar, which the Lunching Pad does not come equipped with anyway. 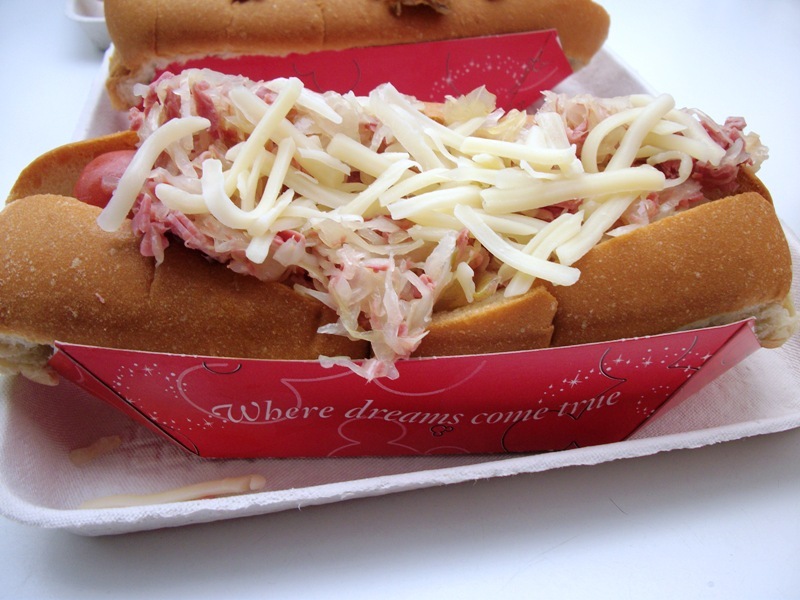 However, aside from the Reuben Hot Dog, the mile-high additions make it almost impossible to get the toppings and hot dog in a single bite. It was agreed that most often you end up with two layers, one bite for the toppings and a second for the hot dog. The other problem for the Lunch Pad dogs are the sides. While I understand that there is more to the actual hot dog, paying a dollar more than I do at Casey’s Corner for a hot dog, dressed up the way I want it fixed, with a side of French fries makes the prepackaged apple slices and chip bags seem simply lackluster. Add to this that the stand also serves pretzels and whole pieces of fruit, neither of which are offered as a side, and the value of the Lunching Pad’s hot dog offerings seems to be slipping like cheese sauce off of the dog. Overall, I found the Lunching Pad hot dogs to be a conundrum to eat and paired with a slim side. 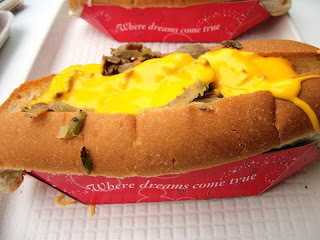 This isn’t to say I wouldn’t give the dogs a second bite, but the next time I have a hot dog hankering, I’m more likely to stick to Main Street U.S.A. and Casey’s Corner. Cheese Steak was pretty good, but it seems that the group thought the Reuben was easiest to eat and tasted most like a hot dog.